Mens 100% Organic Cotton BLACK Crew Long Sleeve Tee - 3420M. MADE IN USA. This Organic Cotton Long Sleeve Tee Shirt has super soft Ringspun Organic Cotton that is super comfortable. This Long Sleeve Tee starts out soft, and gets softer and more comfortable with each washing. Versatile great staple for everyday wear. Sizes are S, M, L, XL , 2X. Check our Sizing Chart for measurements. 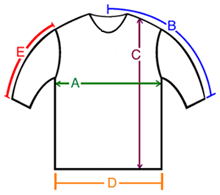 A: Chest / Bust circumference 36-37" 38-39" 41-42" 45-46" 48-50"
B: Sleeve length from center of neck to end of sleeve 32" 33" 34" 35.5" 37"
C: Body length from shoulder to bottom of hem 26" 27" 29" 30" 31"
D: Hem circumference 37" 40" 43" 47" 52"
E: Sleeve length from shoulder to end of sleeve 24" 24" 24" 24.5" 25"